COARE — Connecting people with the ocean: Good riddance – SB 3442 is dead! Good riddance – SB 3442 is dead! We have long supported the promulgation of reusable bags and containers, and we encourage people to eschew and reduce the consumption of single-use plastic items. We've helped raise awareness of the environmental and economic impacts of plastic litter, and we've supported a great number of policies that try to address these issues head on. Well over 100 jurisdictions across the United States, and even 11 entire nations have banned single-use plastic bags. Naturally, certain industry interests are not pleased by these bag bans, and they do everything in their power to fight the bans we're trying to implement. They also dig in deep with a new tactic recently. Instead of trying to stomp out bans as they begin to sprout, they are now trying to convince lawmakers just to prohibit bans. Illinois Senate Bill (SB) 3442 was a prime example. Earlier this year, SB 3442 snuck through the Illinois General Assembly as a wolf in sheep's clothing. Disguised as a pro-environment recycling bill, SB 3442 did nothing in terms of increasing recycling efforts of plastic bags (which doesn't work anyway). However the real bite to this bill was that it sought to preempt "home rule", and would have specifically prohibited municipalities from not only banning single-use plastic bags, but would have also prevented municipalities from implementing their own recycling programs. Illinois residents use more than 4.8 billion single-use plastic bags every year. 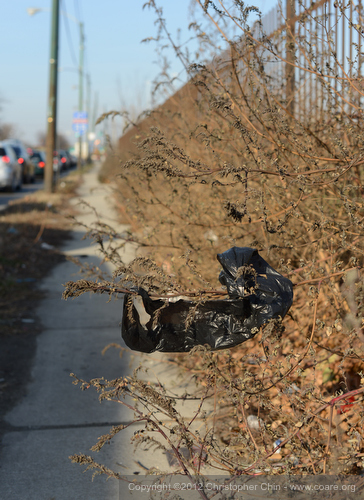 The State of Illinois spends more than $9 Million annually for litter cleanup efforts. As plastic bags comprise an inordinate percentage of the litter stream by weight, they are disproportionately responsible for those costs. Moreover, this figure does not include any of the energy costs associated with producing single-use bags, nor does it consider any of the negative environmental, economic, and public health costs associated with single-use bag litter. "urban tumbleweed" yesterday in Chicago. Plastic bags are a costly, environmentally damaging, and easily preventable source of litter and pollution. Light and aerodynamic, plastic bags are uniquely litter-prone even when properly disposed of, and pose a serious threat to the environment and wildlife in our streams, waterways, lakes, and oceans. Plastic bags never truly disappear in these environments; even when they are no longer visible to the naked eye, plastic bags have merely photo-degraded into tiny particles that absorb toxins and contaminate our food chain and water and soil quality. Plastic bags also make up a disproportionate share of the litter stream, harming storm water systems, increasing cleanup costs for local agencies, and eating away at taxpayer dollars. Recycling of plastic bags, while seemingly well intentioned, would accomplish nothing. A similar 2006 California recycling policy failed. Despite the creation of a statewide collection infrastructure for plastic bags, a mere THREE percent (3%) of plastic bags have been recycled. Plastic bag recycling is neither practical nor cost effective. The market scrap price for recycled plastic comes nowhere close to covering the costs of collecting, transporting, and handling the bags. Nationally, the US EPA shows a 4.3% recycling rate for HDPE plastic bags and film combined. Recycling is not the answer. Despite efforts to expand recycling programs, in other States and municipalities around the world, the recycling rate of single-use plastic bags remains around 5%. The remainder of these bags end up in our landfills or as litter, clogging storm drain systems, and making their way to our waterways and ocean. It is estimated that 60–80% of all marine debris, and 90% of floating debris is plastic. Plastic lasts for hundreds of years in our environment and may never biodegrade in the ocean. As a result, it poses a persistent threat to wildlife. At least 267 species worldwide have been impacted by plastic in our oceans, including plastic bags. SB 3442 would have set a horrible precedent. We appealed to the Governor of Illinois, Pat Quinn, to veto the bill. I had the opportunity to meet Governor Quinn when he signed our shark fin bill (HB4119) into law, and in speaking with him, it was immediately apparent that this man wanted to do the right thing. Since SB 3442 was marked as having fiscal impact, the Illinois General Assembly required a 3/5 vote to pass both chambers. How much of a vote would be required to override the governor's veto? 3/5. Yikes! Yes, the vote was presumably already there, and the Governor was sticking his neck out for us. SB 3442 was a controversial bill in both chambers of the General Assembly, and found support mostly as a result of its spurious language. Just as we were able to convince inland legislators and constituents of the importance of shark conservation, we were confident we could help illuminate the true intentions of this deceptive bill. We assured the Governor that we could provide the support necessary to sustain his veto. 12-year old Abby Goldberg from Grayslake, Illinois started a Change.org petition to encourage the Governor to veto SB 3442, and in the end, she was able to present Governor Quinn with more than 170,000 signatures from around the world. He graciously accepted them at a press conference, and this also helped shed more light on the issue. On 26 August, Governor Quinn officially rejected SB 3442, much to our relief! But remember, that 3/5 vote was still looming, and you know that the industry was going to try to rally. Knowing that legislators generally only alter their positions for a very good reason, we had our work cut out for us. Well, as they usually do, truth and awareness usually prevail, and we're pleased to say that SB 3442 is now officially dead! The bill's author, Senator Terry Link (D-Lincolnshire), filed a motion to override the Governor's veto, and the Senate rejected that yesterday afternoon. Thank you, Governor Quinn, for doing the right thing, for believing in us, and for having the political courage to follow your convictions. Thank you, Abby for starting your Change.org petition, and for bringing your voice and so many others into the mix. And thank YOU, all of our supporters, for your phone calls, e-mail messages, and for sharing our calls-to-action to raise awareness of this issue and provide the support necessary to make this happen. One of our principal philosophies at COARE is that everyone has the power to make a difference. We encourage you to be as involved as possible, and applaud those who choose to take more active roles or work in the field . . . but you can make a difference — now and today. Are you ready to change the world? We are!